After World War II why did the Soviets and Allies mistrust each other and how did this apprehension lead to the Cold War? The Cold War (1945-1991) represented a series of localized conflicts and intense diplomatic rivalries between camps led by the capitalist United States and the Communist Soviet Union. This era also saw a massive increase in civilian and military technology, including thousands of nuclear weapons and the means to deliver them across the planet. This era was largely an outgrowth of the previous decades, with a special focus on the roles the United States and the Soviet Union played in the Second World War. As Europe and Asia prepared for a long rebuilding process both sides offered their own visions for a postwar reality and security. As Soviet troops displaced German ones Stalin promised free and fair elections across Eastern Europe. In some places, the exiled government returned and limited elections were held. However, many of these governments were forced into coalition governments with Communist-led Popular Fronts. Within several years these Popular Fronts seized power in every country occupied by Soviet troops and installed regimes loyal to Stalin. Germany had invaded Russia twice in less than thirty years, causing millions of deaths. Furthermore, Germany was largely destroyed by the current war, with nearly twelve million killed in the conflict. Ethnic Germans were expulsed from various regions of Eastern Europe, especially in Poland and Czechoslovakia, two regimes soon to be loyal to Stalin. The United States had not intended to become involved in the conflict in 1939. The 1941 attack on Pearl Harbor led to massive American involvement in both the Atlantic and Pacific Wars. Propping up the Western Allies, U.S.-led troops occupied most of Western Europe, Greece, and much of Asia. President Roosevelt and his successor Harry Truman were led by a combination of democratic idealism with the harsh reality of the failures of the Treaty of Versailles. Seeking to learn from the mistakes from the end of World War I and the interwar era, the U.S. served as a stabilizing force against post-war chaos and Soviet expansionism. There were similar seeds of conflict in East Asia. Soviet troops occupied much of China and Korea. Local communist forces had stayed in place in much of Vietnam. While the Nationalist faction in China was friendly with both the U.S.S.R. and the U.S., the Communist Party of China won a series of victories against the Nationalists in the re-emerging Chinese Civil War. By 1948 the Communists had effectively won the conflict, confining the Nationalist Republic of China to Taiwan. Furthermore, the Soviet forces in Korea established a client state in the northern half, the Democratic People's Republic of Korea. In 1950 as American forces largely left Korea, the North invaded the South. Proxy conflicts and espionage erupted around the globe during the Cold War. The early posturing and saber rattling proved to be a template for future action by the Soviet Union, the United States, and their allies. As the conflict continued many of the first sites of tension erupted into wide-ranging diplomatic and military conflict. ↑ Hopf, Ted. Reconstructing the Cold War: The Early Years, 1945-1958 Oxford: Oxford University Press, 2012. Page 45-48. ↑ Harrington, Daniel. 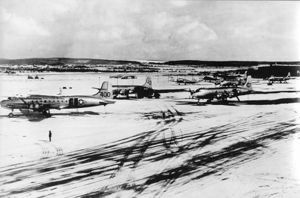 Berlin on the Brink: The Blockade, the Airlift, and the Early Cold War. Lexington Kentucky: University Press of Kentucky, 2012. Page 77. ↑ Kindleberger, Charles. Marshall Plan Days, New York: Routledge, 1987. Page 66. ↑ Caldwell, Curt, NSC 68 and the Political Economy of the Early Cold War. Cambridge: Cambridge University Press, 2011. Page 211-215. This page was last edited on 28 January 2019, at 20:27.